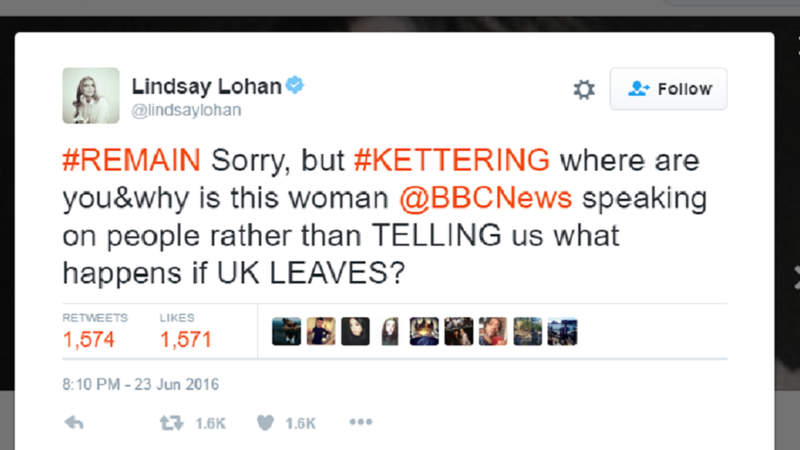 The multitudinous layers of the enigma that is Lindsay Lohan have continued to unfurl for us on the eve of the Brexit referendum—which is to say that who knew Cady Heron was hella into UK politics? Lohan began her glorious, politically-fueled twitter rampage around 5 p.m. EST, urging British citizens to “#besmart” and vote to remain in the European Union. Unfortunately, her social media call-to-arms began hours after the polls have closed. Despite this, let’s observe a “best of” roundup. Does this include ponies, or just the British islands not featured in The Wicker Man. Since when was professional demon Margaret Thatcher relevant again.